Today, I've got the review of The New Black - Runway Set for you today. There are 8 polishes in this set. Here's the Pack it came in. Pretty pretty!!! 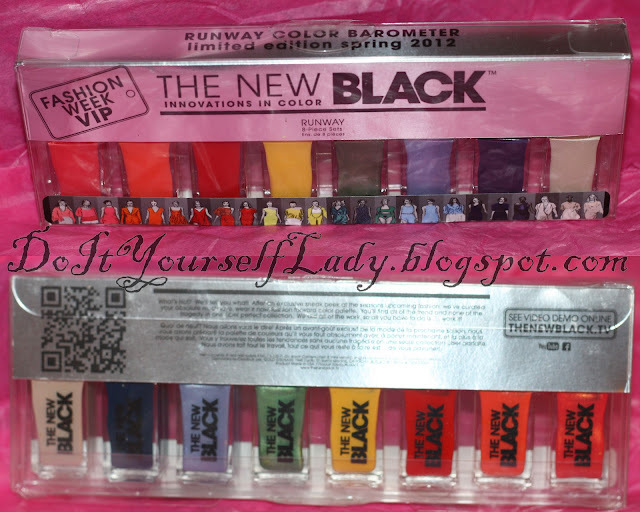 To view Individual swatches and review, Please Click Read More Below. (Picture Spam ahead). All Swatches were flawless and 2 coats except otherwise indicated. First up, is this one. Almost a neutral color that is work appropriate. I Love this kind of colors as a base for nail arts. No Topcoat was used here. This next one is like a Navy Blue, Denim color. Almost jelly-like and a breeze to apply!!!! If there wasn't a red in this set, this one would be my favorite. Lol... No Topcoat, and it shines for days. And this one is a purple blue... Frosty looking, with slight shimmer. Next up is a green polish. Yet another Frosty looking polish in this set. As with colors and finishes like this, you can see slight brush lines, so I did use a topcoat to minimize the brush lines. And Drum Roll Please!!!!! There's this Yellow that I want to declare as my favorite yellow polish ever!!!! We all know yellows can be hard to work with. But... This one, this one was nice to mama! Lol... I prepared for the worst before application, and I started with one thin coat, then, another, and another. But I ended up realizing that two careful thick coats work just as fine. I want to say this pictures are color accurate... This is not a mustard yellow, it's not cab yellow.. it's just yummy good ol' sunny Yellow! And then, we have this red! I have a weakness. Bright Polishes are my thing. But when those bright polishes are red?! Well, Mama likes!!! Lol. Three coats here. The finish is almost jelly-like. Love the Squishy bright goodness. The only thing I kinda don't fancy much about this polish is that I still have VNL (Visible nail line). But, I guess that's OK since it's not might visible IRL. Then there's this Orange. It was hard to capture the true color and beauty of this one. I almost cried changing my camera settings just to capture it right. Oranges are making lots of appearances this summer, so I can absolutely see me rocking this one during the summer. And Last but certainly not the least is this gorgeous coral looking polish. With a gorgeous shimmer in it. This is just about color appropriate as I could capture it. I love the gold shimmer in it. The Last Three Polishes are definitely some of the brightest in this Set. They might look slightly alike on here, but they are definitely different in person. I am happy with all the polishes in this set and they will be beautiful on nails for this summer. If you're interested in these polishes, you can purchase them at Sephora. Click Here to "Like" The New Black on Facebook. Click Here to Follow The New Black on Pinterest. I absolutely KNOW what you mean! I never say Yellows are awesome, except they WOW me like this one. I am soo going to wear that a LOT this summer. Lol.. The shimmer in the coral is beyond awesome! Wow, I am loving those blues and reds!!! You are definitely right in that there is something for everyone here! :D Awesome swatches! Indeed, I love when a collection/set caters to everyone's need. 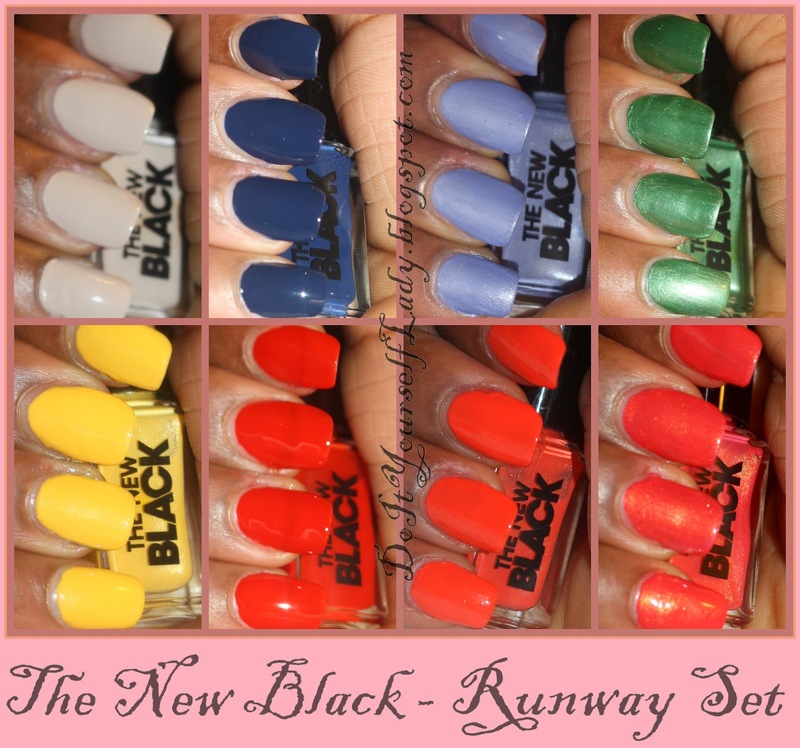 great swatches and gorgeous colors. Love all of them, especially yellow and red! Thanks dear. Glad we all agree the yellow is lovely. Lol..
Love the jelly look of the red. So pretty! Nice! I love this set!